Palette Maker is a simple tool to help artists create color palettes. The interface may seem unfriendly at first, but check out the user guide on github: I go into a lot of detail on how to use the different functions of the software, including how to create similar colors to the one in a given position and how to interpolate to create smooth color curves. 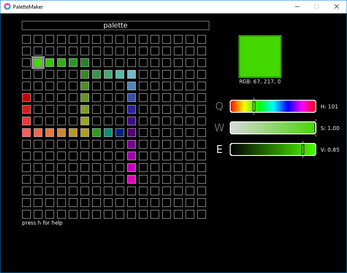 Palette Maker is made using LÖVE 11.1. 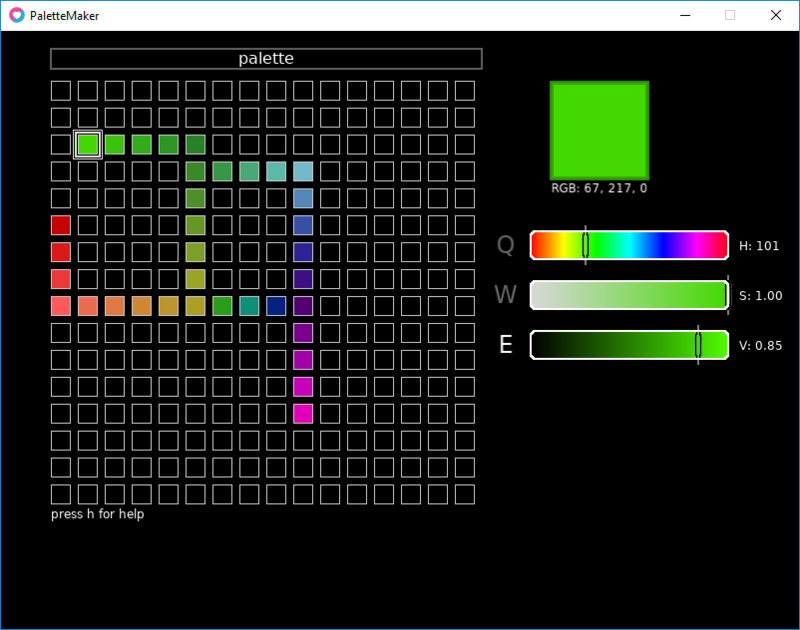 If you have LÖVE installed, you can download just the palette-maker-love.zip file and run it. If you don't have LÖVE installed (and don't want to install it), you'll have to download the palette-maker-exe.zip file, which is 10 times larger. The easiest way you can contribute to the tool is just giving feedback. Any comments, good or bad, are welcome and will be taken into account for the next versions. If you're a nerd like me and you like to code, this software is open source under the MIT license. This means you should feel free to fork it and/or send your pull requests my way. The source code can be found on GitHub. If you're downloading the *-exe.zip file for Windows, then you're good to go. Just download it and execute it as a normal app. If you're downloading the *-love.zip file, you'll need LÖVE 11.1 installed. After installing LÖVE, you can run Palette Maker by double clicking it (if you've set the file association when installing LÖVE) or by dragging the *.love file on top of love.exe, found where you installed LÖVE.